There’s not much better than a hot piece of toast with fresh jam and a cup of joe. Especially after a night when the Netflix-binge watching forces kept my eyes open for a few hours too late (thank you Orange Is The New Black), toast and coffee is a slice of heaven. There’s just something about a lazy morning spent at the table and the commotion of a household continuing on around while your head gets cleared. It’s not that I have too much going on in life right now, rather the complete opposite. In the absence of stressful college courses, my thoughts wander around the adventures I’ll soon be on and the path it could lead me down. The dwindling countdown to my flight beginning my semester abroad seems to flit in and out of my mind and then the surreal-ness of it all crashes in waves. Poetic, right? Anyways, back to jam – jam is good. So are classic summer tunes. Jam making once was just a chore so the summer surplus could be enjoyed in the dead cold of winter and still is – but I seriously enjoy an afternoon spent canning and listening to a strange mix of old and new songs. So when the boys of the household left for the day, my mom and I found ourselves leaving the farmer’s market armed with fifteen pounds of peaches and five crates of blackberries. A few years back I decided to have my Grandma teach me how to can, since she grew up making preserves in the York, Nebraska summertime – and to say the least, we’ve gone a bit jam crazy. This weekend, we ended up with fifty-four jars of peach and blackberry vanilla jam. I know what you’re thinking, fifty-four jars – who in their right mind needs that much jam!? There’s two explanations for this 1) my mom and I certainly aren’t always in our right minds and 2) homemade jam makes an excellent gift. 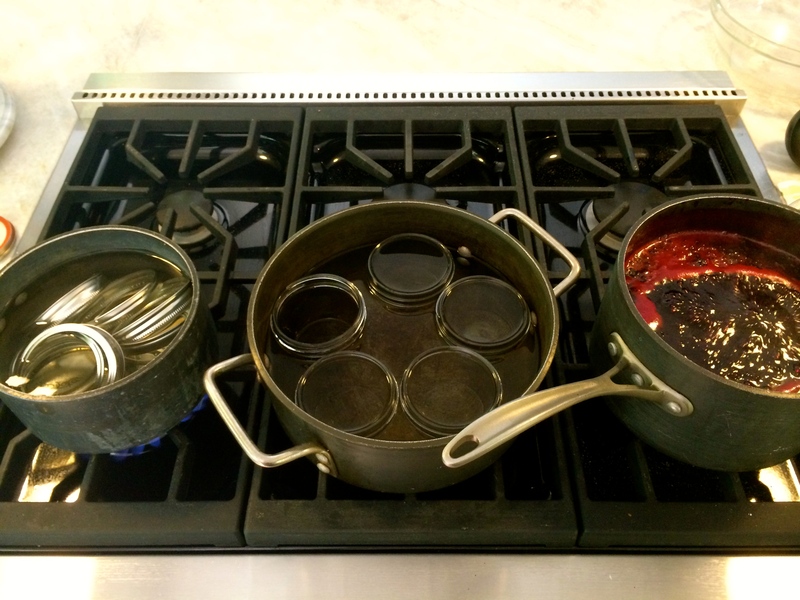 There are so many recipes online that detail the correct steps in canning, so I won’t bore you with the details, but I’ll add in a few tips I’ve taken from my Grandma’s book and jamming experiences. For the variations on the classic berry jam, my mom and I added one grated cooking apple (for the natural pectin) and two scraped vanilla beans to each three cups of prepared fruit. 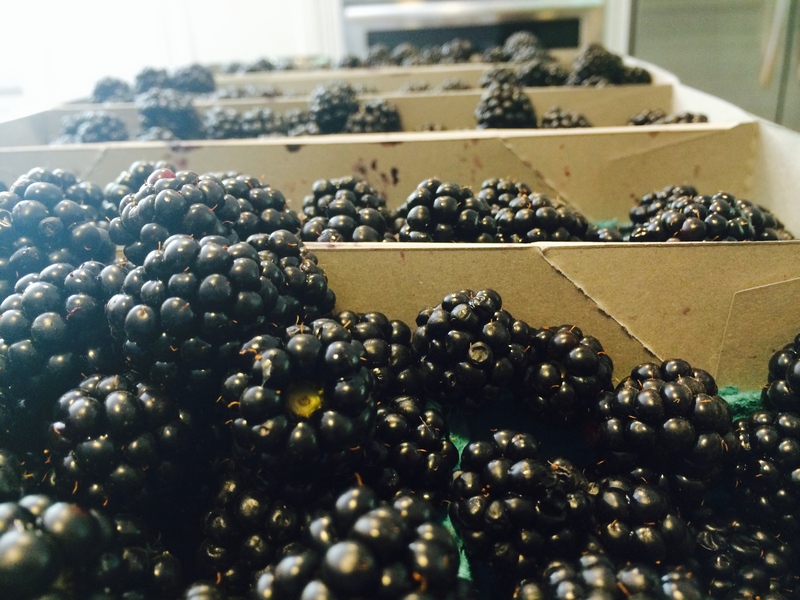 The turn out was a slightly thin jam but the aroma was laced with pleasant vanilla and fresh berries. As for the peach jam, we kept it simple with eight cups fruit and six cups sugar – believe it or not, that’s the low-sugar recipe. Lemon juice is used for the natural preservative and, as the recipe calls for, one box of pectin was the thickening agent. Although jam making is a tedious and messy process (thanks ultimate cleaner/mom! ), it’s well worth the wait. Then when that impending morning light floods through the blinds, you can pad down the hallway and reward yourself with that crisp toast and delectable jam served alongside the steaming french roast. And if the day needs a pick-me-up a little bit later, throw on some classic Jack Johnson or one of my new favorite finds, Sam Garrett and his easy going acoustic music. And when the stress has been reduced and five o’clock rolls around, nothing beats busting out Earth, Wind & Fire for a impromptu dance party…because those are just the best. What’s playing on your mix tape and what are the adventures you’re seeking out this summer? Let me know in the comments below!